This Interactive Fire Lab will be performed to invoke Ganesha his form as Trimukha Ganapati. “Tri” means three, and “mukha” means face. In this benign and powerful form, Ganesha is depicted with three elephant faces. He is seated on a golden lotus and is shown with six arms. It is said that the compassion of Trimukha Ganapati looks after the welfare of those who pray to him as well as the welfare of their families. We can invoke him to remove fear of the future. The fire prayer will be done during the beneficial obstacle removal energies of 4th Moon phase. On this day, the Moon will be in Hasta, a star of charity and enlightenment. 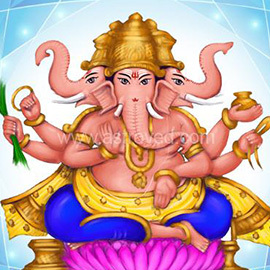 We can ask Trimukha Ganapati to give blessings of reassurance and divine protection. He shines a very compassionate light and dispenses boons.